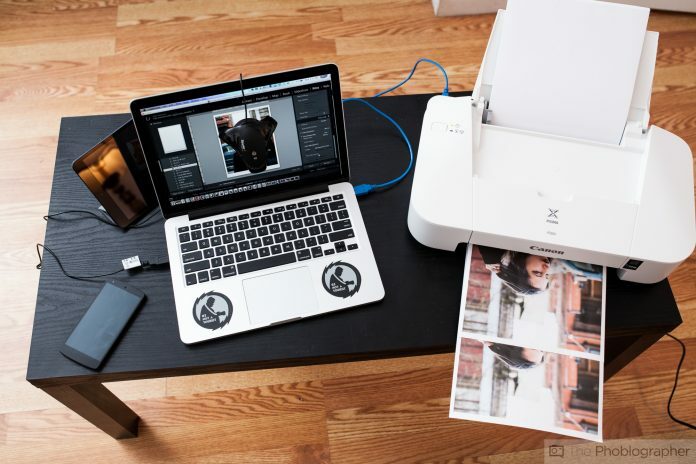 For the photographer on a budget of less than £30, what would you expect from a photo printer? Considering that it costs less than some bottles of whisky, you really can’t expect it to move mountains or beat Usain Bolt in a race. But it can, however, yes you guessed it. Print really clear photos. That’s pretty much the idea behind the Canon PIXMA iP2850 photo printer. Depending on where you go to get your pictures printed, it can cost you more money to get a print made ‘professionally’ than to do it yourself in the comfort of your own home and with very little work on your part. While in 2018 you might expect more from a printer, you have to consider that there are even some camera straps made and sold that are more expensive than the iP2850. It’s very portable. Small and light. The printer can be folded up. Can you believe it? Just like a tee-shirt, this photo printer can be folded up! The top flap comes out to hold paper and there is a paper tray that holds printed paper in place. Here you’ll also find the on/off switch. The printer takes most standard paper sizes around eight inches wide. It’s really that simple. The top flap and paper tray indeed feel solid and like they won’t snap off so incredibly easily. But, I mean we’re not going to lie, if you got in a fight with it, you’d probably win the fight. In other words, the build quality isn’t great. But I have a pretty simple solution, just don’t get in a fight with it and it will last you donkeys. Fact. If your a student or your son or daughter is a student who needs to print out really clear pictures to put in their coursework but can’t afford to do it professionally, if you’re a beginner photographer or just have really cute kids you’d like to take really cute pictures of so you can and put them up around the house on shiny glossy paper… this printer is for you. It takes up little to no room, it’s portable, affordable, simple to setup, and delivers incredible images in the hands of someone who knows what they’re doing. And guess what’s more expensive than this printer? – You get where i’m going with this, so in other words, stick with this printer, you’ll go far kids.